Music is produced by a combination of elements, one of which refers to the instruments used. 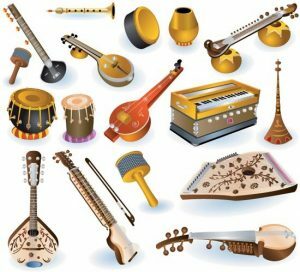 Music instruments are in general classified three banners which are String instruments, Wind instruments, and Percussion instruments. This classification is based on the way these instruments produce sound. String instruments are instruments that vibrate or make sounds when the artist pluck, strum, or hit the strings on the instrument. The sound that comes out after an artist hits, plucks or strums the string is dependent upon a number of factors that include the tension to which the string has been placed, the mass of the entire instrument and the length of the string. String instruments come in different shapes and forms including harps, guitars, and violins. Wind instruments are those instruments that use the air inside them to vibrate and as a result, produce sound. On most occasions, the artist using the wind instrument blow air inside the instrument and the blown air is responsible for causing the vibrations which lead to the sound being produced. The sound that’s produced by the wind instrument is dependent upon a number of factors, some of these include the length of the column of the air and the relative size of the instrument. Wind instruments come in different shapes and forms including saxophones, flute, trumpet, and clarinet. Percussion instruments are instruments that vibrate and produce sounds when they are hit or struck. These instruments do have the capabilities of producing sounds whether without or with a pitch. The sound that’s produced by percussion instruments is dependent upon a number of factors, some of which include the shape of the resonating cavity, the material and the shape of the part of the instrument to be hit or struck. Percussion instruments come in different shapes and forms including the xylophone, the triangle, bells and the drums.